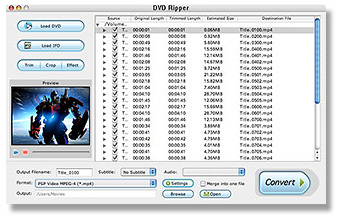 DVD Ripper for Mac enables you to quickly and easily, Rip your DVDs to popular video/audio file formats and save onto your hard drive, portable player, or the device of your choice. Extract and save DVD content to various file formats such as: AVI, MPG, WMV, MP4, DivX, XviD, RM, ASF, MOV, FLV, 3GP, 3GP2, MPEG-1, MPEG-2, MPEG-4, H.264/MPEG-4 AVC, VOB, SVCD, VCD etc. Rip DVD to video and audio for playback on iPod, iPhone, AppleTV, PSP, Zune etc. ...... Convert DVD audio to formats such as: MP3, WAV, WMA, AC3, M4A (AAC), OGG, RA, AU, etc. With this professional Mac DVD ripping software, you can output video and audio files that can be perfectly played on all sorts of video and audio players. Rip DVD to video and audio for playback on iPod (Touch/Nano/Classic/Video), iPhone, Apple TV, PSP, Zune, YouTube (web), Xbox 360, PS3, iRiver, Creative Zen, Archos, PMP, Smart Phone, Pocket PC, PDA, video cell phones, MP4 players, MP3 players, and other portable video and audio players. DVD Ripper for Mac is a powerful program developed to run on Mac OS X (including Leopard and Tiger). It supports both Mac Intel and Mac PowerPC processors and is the most powerful DVD ripping software for Macintosh available on the market! Qweas is providing links to DVD Ripper for Macs 2.0.1.19 as a courtesy, and makes no representations regarding DVD Ripper for Macs or any other applications or any information related thereto. Any questions, complaints or claims regarding this application DVD Ripper for Macs 2.0.1.19 must be directed to the appropriate software vendor. You may click the publisher link of DVD Ripper for Macs on the top of this page to get more details about the vendor.